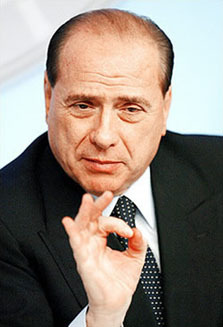 Silvio Berlusconi is the richest man in Italy and the thirty-seventh richest in the world. Owns most of the major television media in his country, and got reliably favorable coverage as he ran for Prime Minister. Convicted of high crimes committed in office, but served no jail time. Net worth with family $9.4B (Forbes 2008).